I’ll pretend that she’s okay with me veganizing it. The first time I made this, I thought I had completely and utterly failed. In a sense, I did, but only out of impatience. One of the most underrated skills as a cook or a baker is patience. Yes, patience is a skill. It takes skill to know to wait before you flip a pancake or give that pan a stir. I’m still working on my patience, both in the kitchen and outside of it. We forget sometimes that we need to be patient with ourselves. There are days where I am so frustrated for not being patient with myself. Knowing when I’m ready, not rushing into something when all I want to do is dive head-first. When I hit a wall, I don’t think to stop and take a breath before I try again. All I want to do is reassess the situation and think myself above and over this wall, and I end up climbing over the wall instead of simply closing my eyes, taking a breath, and feeling for the doorknob. I go a million miles a minute, and it’s getting to the point where I can’t juggle everything at once like I once used to do. We need to remember to be kind to ourselves. To give ourselves the chance to decompress and recompose before stepping out to meet the challenge. That’s not to say that we should never just barrel through the obstacles when the going gets tough, but there’s validity in taking the slow and steady route. At this point, I can’t deny the success I’ve had with my usual approach of beating the wall down and climbing over the rubble. Sure, it was a little messy and I may have gotten a little hurt in the process, but I made it through and I’m healing nicely. A vague reference, I know. But more on that another day. 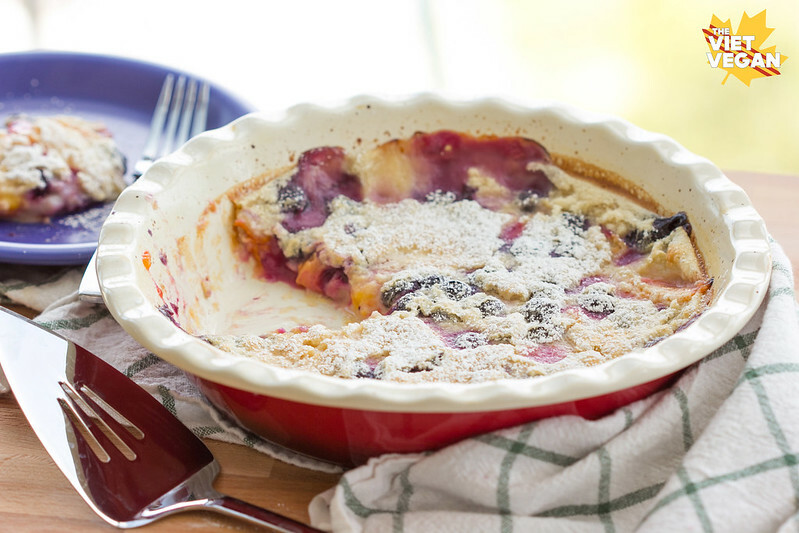 Have you ever tried clafoutis? A typically non-vegan dish, it’s a cross between a custard and a pancake. The French have a knack for taking beautiful fruits and folding it in a golden embrace to showcase their summer bounty. Be it inside crepes, embedded in a beautiful tart, hidden in pastries, the French know how to love their fruit. Clafoutis is more known for the use of summer cherries, but since I’m allergic, I decided to bedazzle mine with golden plums and plump blueberries instead. Since this dish needs the custard-like texture that eggs yield in desserts, I used the newest sensation in vegan baking: aquafaba. Aquafaba is essentially chickpea water. It could be the water from a can, or concentrated liquid from cooking dried chickpeas, but it’s a thick, almost gelatinous texture that mimics the texture of raw egg whites. Since chickpeas have been sitting in this liquid for hours to days, the proteins from the chickpeas seep into the water and has a similar protein structure to egg whites. As a result, aquafaba can be whipped up into meringue (with the help of stabilizers like acid or cream of tartar) and the world of meringue opens up to vegans. 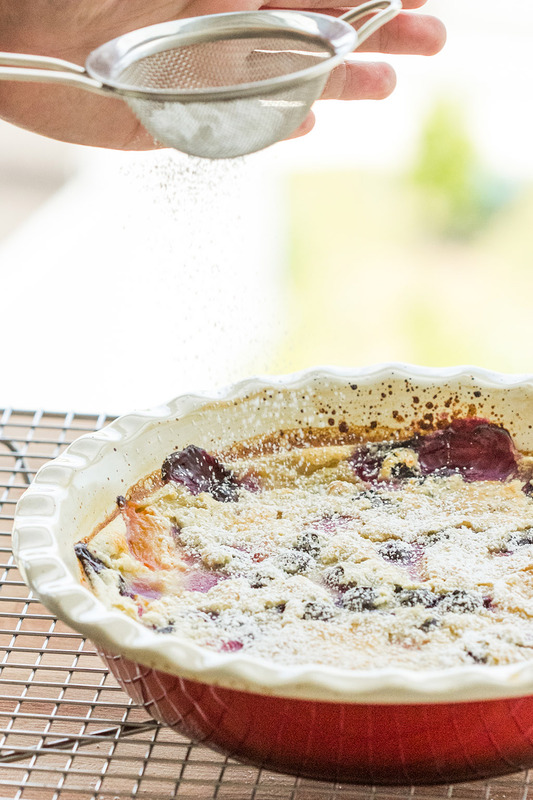 The trick to clafoutis is patience. The first time I made this, I was so enamoured by the scent of vanilla and baked berries that filled my apartment, all I wanted to do was dig in. When I did, I was met with a goopy, sweet mess. It was delicious in every way, but it didn’t set up like the custardy clafoutis I had seen other versions. Disappointed and sad, I let my failed clafoutis sit while I sulked for a couple hours. Finally I came back to it, craving a spoonful of messy fruit, I was pleasantly surprised with a success! 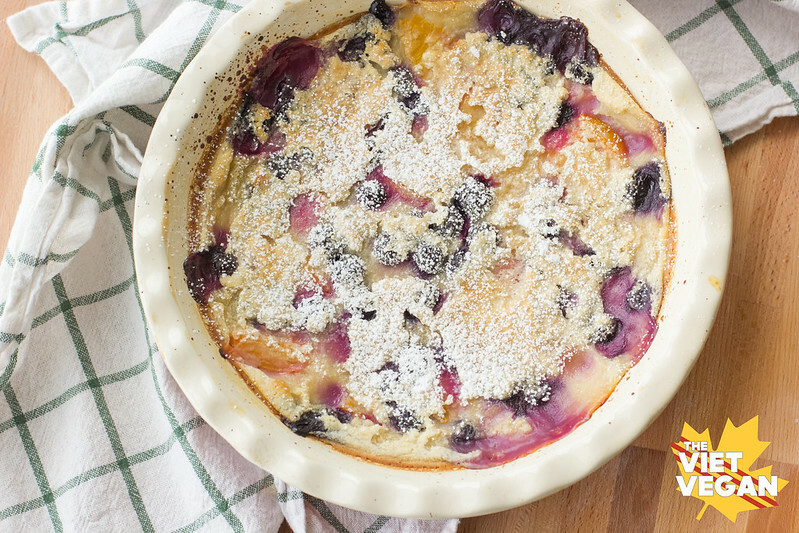 The clafoutis had set and yielded that thick, standalone texture that was creamy yet firmly holding all the fruit together. The only sad thing was that by then, I had massacred the dish and it wasn’t photograph-friendly. The second time around, I reduced the amount of sugar drastically (I like tart fruit, so if you’re like my good friend Janelle who doesn’t deal well with tart plums, add a bit of extra sugar to cut through), whipped the aquafaba for a while to get an airy, bubbly texture, and waited until the clafoutis was just barely warm before I dug in. Worth the wait. A sweet dusting of icing sugar gives this dessert a romantic yet rustic feel as you serve it to your family and friends. 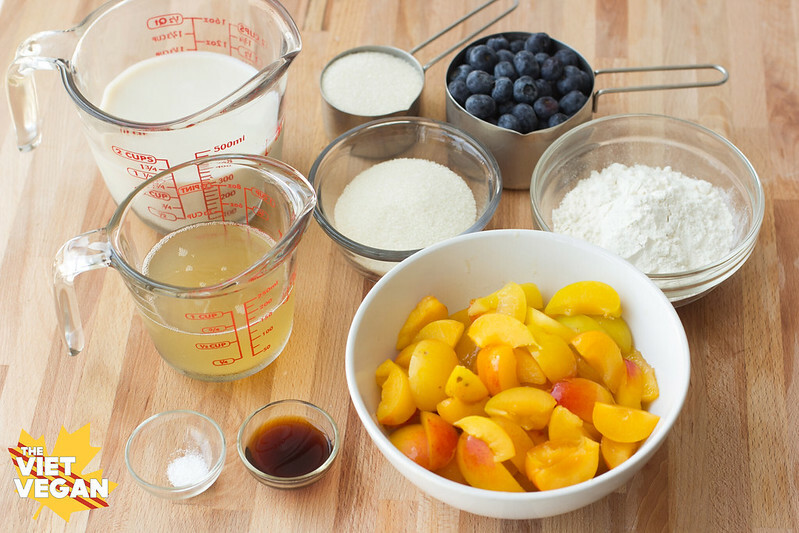 Try using whatever fruits you’d like: peaches, apples, pears, or cherries. 1 heaping tbsp icing sugar for dusting. Using a blender or food processor, blitz aquafaba and sugar until the mixture is thickened and foamy, about 3 minutes. You don't want any sort of peaks, just a very fluffy and foamy mixture. Add soy milk, flour, vanilla extract, and salt and blend until incorporated. In a well-greased 9-inch pie pan, pour about 1/2 the batter into the pan, about 1/2 inch deep. Bake for 15 minutes until the edges are slightly golden and the middle is only slightly jiggly. 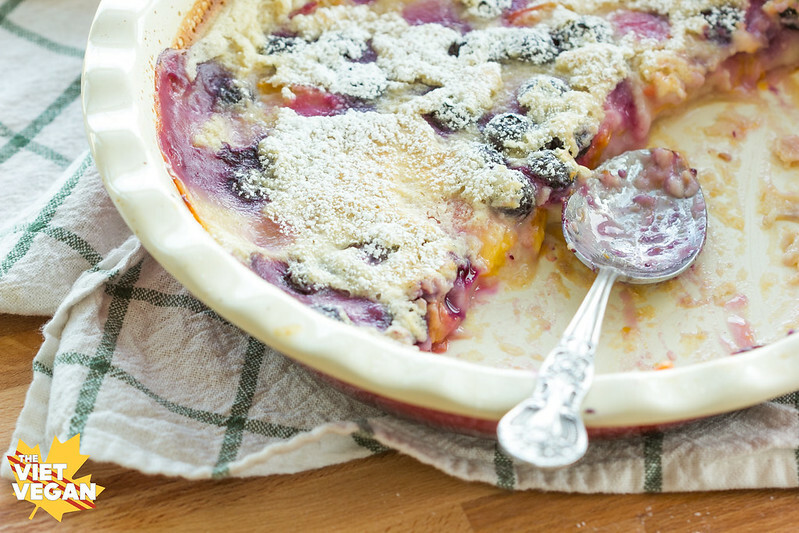 Remove from oven and add the fruit on top of the bottom baked layer. Sprinkle remaining 2 tbsp of sugar, then pour over the remaining batter. Bake for 45 minutes until the top is lightly golden. Remove from oven and let cool until just barely warm. Do -not- cut into it before it is cooled, otherwise the clafoutis won't have set yet. Thanks June =) Yes, I have burned my mouth on many piping hot chocolate chip cookies. ._. I just recently became vegan, its been easy on the basic cooking front since I went to culinary school, It's the baking part that has been " well I guess I wont be eating or baking that anymore" I just found about aqaufaba 2 days ago and i'm totally excited! now I can go back to baking like I use to. I printed this recipe and I can't wait to make this. thank you so much for post this. I will become a regular on your site! ingenious! used to make Julia's clafouti in pre-vegan days and you're right - supposed to be served "lukewarm" which is hard to do:) I made the mistake of using a too small pan (in toaster oven), so took >1 hr to set, but finally! after it cooled we were able enjoy the yummyness. 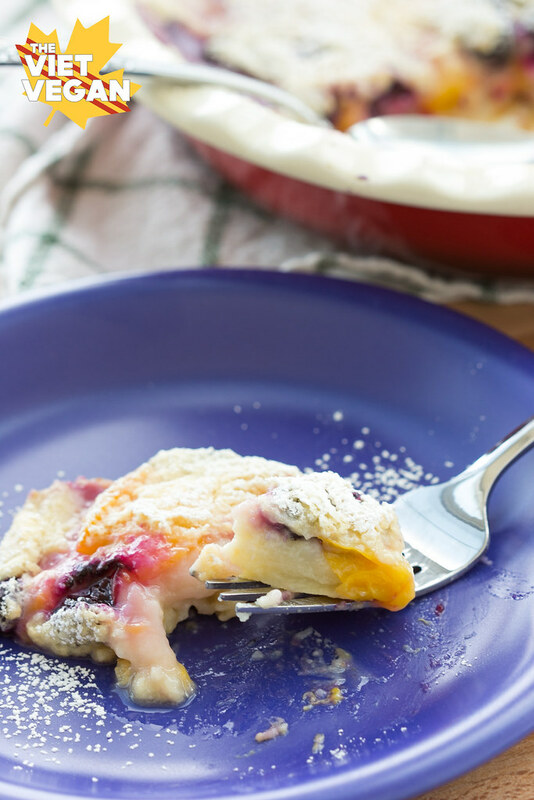 thanks much for sharing this recipe - looking forward to trying different fruit variations! Glad you were able to enjoy the deliciousness =) Thanks for sharing your experience! It says to pour 1/2 the batter into the pan, what about the other half? Hi there, I can't see any almond meal listed in the recipe, should there be any? If not, what is it that you sprinkle over the fruit before pouring the liquid over (fruit step is also missing from recipe). Thanks! Hi Lucy! It's not almond meal, it's powdered sugar/icing sugar :) And the fruit step is in the second half of step 4.